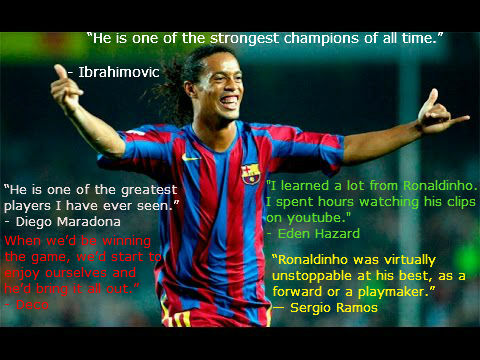 Ronaldinho gave football fans a plethora of unforgettable memories. Be it the glorious chip free-kick over David Seaman or the one-man show against Real Madrid at the Santiago Bernabeu. The Brazilian’s prime didn’t last very long but it was enough for him to seal his place among the pantheon of football’s greatest players. Ronaldinho’s mastery with the ball was a cut above the rest. He is easily one of the most gifted players of all-time and with a bit more discipline, he could’ve had his name etched alongside the Peles and Maradonas. The former Barcelona and AC Milan forward showed the world things they had never witnessed before. Always calm and collected in the face of danger, Ronaldinho usually played with a smile on his face. For his incredible ability, the Brazilian genius is still revered by modern day greats and football fans alike. Presenting the top 30 quotes on the magician that was Ronaldo de Assis Moreira aka Ronaldinho Gaucho. – Frank Lampard paid a special tribute by posting a picture with him on social media. – Giovanni van Bronckhorst, on Ronaldinho’s below the wall free-kick. This is not normal. He’s not normal, he never has been. He lives in the magnetic spectrum. What a goal this is. Beyond world-class. Astonishing. Cooler than a bomb disposal expert. That is amazing piece of football finishing by King Ronaldinho. – Ray Hudson describing Ronaldinho’s goal.